A Steem wallet allows you to support streamers with upvotes. Easily monetize your channel by connecting a wallet. Our goal is to provide a live stream mix of relaxing natural(ish) ambient audio with LIVE animal action. To give you something you can listen to in the background or enjoy full screen. Something that can be exciting, beautiful and funny. That's never the same and always entertaining. So listen in while you finish that spreadsheet or sit back with some popcorn and enjoy the show. Either way we welcome you to our beautiful home and I hope you love it as much as we do. The ducks have been let free and are now running around the yard making a mess with the rest of the animals. It's amazing how fast they grow. 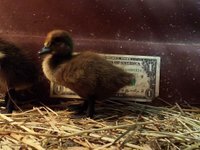 The baby duck cam is now off line and will be replaced soon by something... cool? Evening feeding time will change as the days get longer. We are thinking about doing a Goat Milking demonstration. If anyone interested in that let us know in the comments. Come join us for the excitement! Stay for the relaxation! 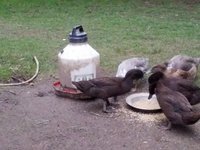 Nothing is more fun than watching Goats, Ducks and Chickens do their thing. It's like a fish tank but not as boring. Cameras will be left on 24/7. @cowpatty 2.000 STEEM Use this for more cameras. Keep it up I like it! Send a gift to meanroosterfarm. Log in to send a gift. Gift STEEM to meanroosterfarm using ETH, LTC, BTC, or DOGE! *This transaction will incur a 1% conversion fee. *This isn't a guaranteed rate. Prices fluctuate, and the rate of any transaction is only "locked in" once the transaction is fully confirmed on the input blockchain. No account? Click here to sign up!